Are your power and data needs as diverse as the country you live in? Cambio is Byrne's solution to true power diversification in the workplace, allowing the use of multiple receptacle types within one system. Ellora offers the same reliable, functional and aesthetically-driven design that Byrne's technology centers are known for—with the added ability to customize the outlets to best suit your needs. Ellora delivers a customizable power/data solution that really speaks your language, wherever you are. Cambio is an international, single-circuit, modular electrical system designed to configure into any furniture system. It allows for rapid installation and quick disconnection as needed—making it not only a flexible solution, but a cost-effective one. Each receptacle block offers two outlet positions designed to accommodate a variety of international receptacle types. 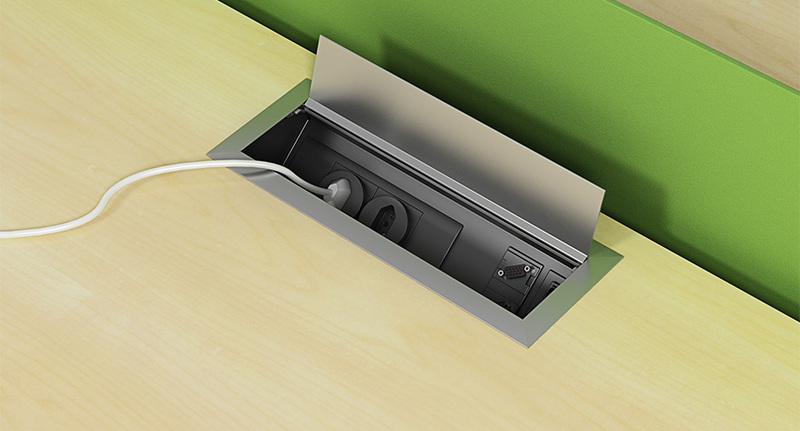 Receptacle blocks can be mounted in various applications including panels as thin as 10mm thick using snap-fit installation, cable/wire trays under workstations, desktop power/data accessories and floorboxes. For more information, please contact your Byrne Customer Support Team at 616-866-3461.